After pushing back Union skirmishers at the woodlot, Kershaw attacks Harker. The 2nd South Carolina makes its way up the draw behind the knoll and outflanks the 58th Indiana. When the 58th withdraws it leaves Harker in an untenable position. The Union brigade withdraws in a reasonably orderly fashion. 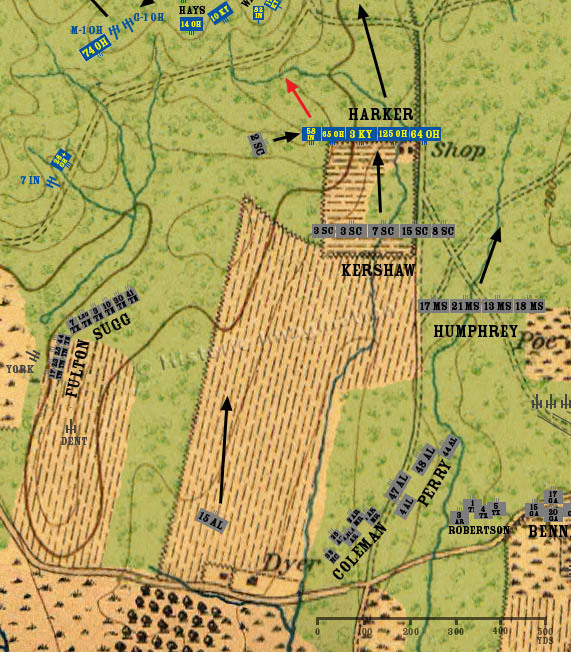 Humphrey’s Brigade shifts to the right of Kershaw, while the 15th Alabama continues north toward the sound of the fighting.